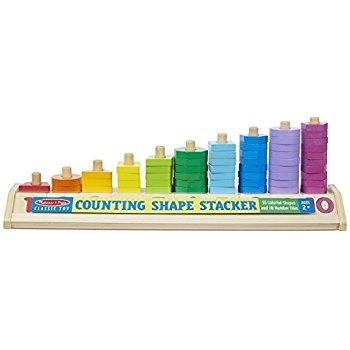 Stacking toy with 55 colorful shapes and 10 number tiles. Shapes include circle, square, triangle, diamond, rectangle, hexagon, and more. Encourages color, shape, and number recognition, as well as sorting and fine motor skills.